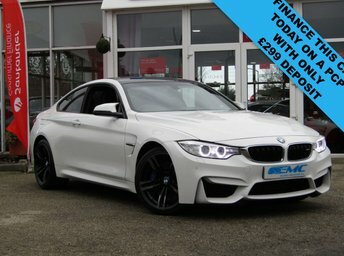 STUNNING 430 BHP, BMW M4 3.0 COUPE 430 BHP. Finished in ALPINE WHITE with contrasting BLACK SPORTS HEATED LEATHER. This M4 offers great interior and boot space. The twin turbo, 3.0 litre engine punches out a huge 430 BHP firing it from 0-60 mph in only 4.1 seconds. This is a must have fun family car. Features include, Sat Nav, Heated Leather Electric Memory Seats, DAB, B/Tooth and much more. 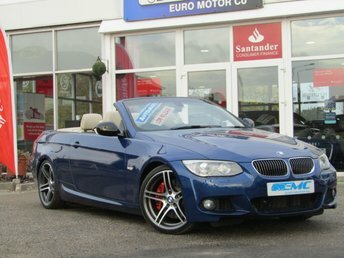 STUNNING, LOW MILEAGE, BMW 335i SPORT PLUS EDITION CONVERTIBLE. Finished in LE MANS BLUE metallic with contrasting Cream Beige DAKOTA HEATED ELECTRIC SEATS. This car is for those who appreciate performance with prestige looks. This four seater convertible is an ideal summer cruiser. Features on this car include Sat Nav, Full Leather Electric Seats, Harmon Kardon, Park sensors, Adaptive Cruise, B/Tooth and much more. 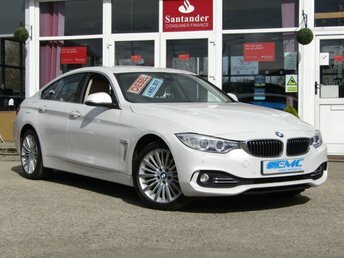 STUNNING, 1 OWNER, BMW 420 XDRIVE, GRAND COUPE, LUXURY AUTO COUPE. Finished in MINERAL WHITE PEARL with contrasting FULL HEATED LEATHER. This a sleek bodied coupe with great handling and great levels of comfort. The mineral white is one of the most desirable colours. Features include Sat Nav, Heated Leather Seats, DAB, Upgraded Alloys, Front and Rear Park Sensors and much more. 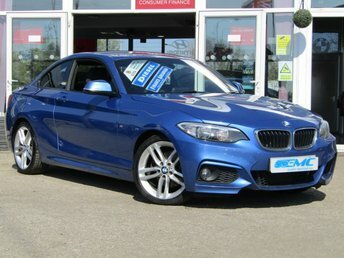 STUNNING, 1 OWNER, £30 ROAD TAX, BMW 118D 2.0 M SPORT, 150 BHP, 3 DOOR. Finished in ESTORIL BLUE with contrasting part LEATHER trim. 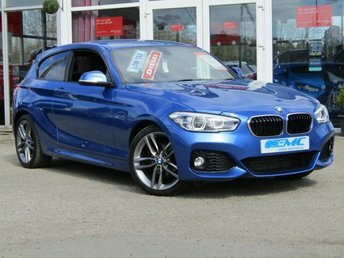 If you are looking for a small hatchback with that spacious feeland enjoy driving then look no further. Features include Sat Nav, Part Lerather, DAB, B/Tooth, Park sensors, Cruise and much more. Dealer serviced at 23450 miles, 39995 miles, and recently at 57914 miles on 13/2/2019. MOT due on 15/02/2020. STUNNING, 1 OWNER, 65 plate, BMW 218I SPORT 1.5 CONVERTIBLE. Finished in Black Sapphire with contrasting RED DAKOTA LEATHER. If Style and comfort is important to you then look no further. The BMW 2 series Convertible is one of the most desirable models of its class. Features include, Sat Nav, Red dakota leather, DAB radio and much more. STUNNING, LOW MILEAGE, BMW X1 X-DRIVE 18D X-LINE EDITION 2.0 Diesel. Finished in a special edition VALENCIA ORANGE Pearl Metallic with contrasting NEVADA Full Heated Leather. This BMW X1 is an excellent choice if you want or need a practical SUV. Quality brand with plush interior, spacious, comfortable and fun to drive. Features include Front and Rear Park sensors, Cruise Control, DAB, 18" Alloys, 2 KEYS and B/Tooth. 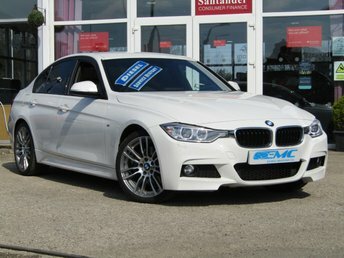 Euro Motor Company is the best place to find great deals on used BMW cars for sale in Rotherham. With years of experience helping motorists to track down their dream vehicles, our team is well placed to make sure you find a used BMW to suit your budget and lifestyle. Outstanding deals are available on nearly new hatchback models such as the BMW 1 Series, as well as stunning two-door rear-wheel drive coupés like the BMW 4 Series. All of our used BMW cars are given a thorough inspection before arriving on the forecourt, so you can drive away with complete peace of mind. Browse our latest range of used cars now.